Tree down on south entrance to Stonehaven at Kirkton flyover - submitted by reader Jim Smith. Gusts of up to 40 miles per hour have been recorded in Durness and Forres, while temperatures across the region dipped below freezing. It is expected to dip again with -4C in Dalwhinnie among the lowest temperatures tomorrow night. 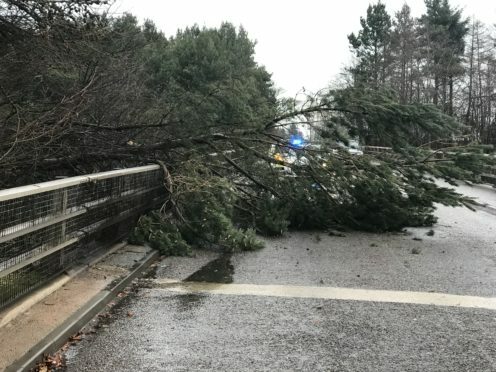 A tree was blown down across the Stonehaven to Kirkton flyover that takes drivers over the A90 Stonehaven to Aberdeen road. The Skye Bridge has remained open through the day although motorists are warned to take care while using the crossing. Calmac had to pull a number of its island services because of high winds with ferries between Mallaig and Armadale and Tarbet and Lochranza being cancelled. Northlink Ferries also experienced cancellations to their Pentland Firth service between Stromness and Scrabster due to the adverse conditions. The Lecht ski centre in Aberdeenshire was forced to closed due to the high winds, allied to gusting conditions and snow. Looking to the week ahead, Sarah Kent from the Met Office said: “It is going to be a cold and frosty start for Grampian. “The far south of the region will be bright with some sunny spells with showers confined to the far corner of the north-east. “It will be a chilly day with temperatures reaching a maximum of 3C in the afternoon. “Throughout the evening there will be a band of sleet and snow drifting eastwards.